Comment: Firstly, Apache Dropout as a combo could be considered an archetypical American combo because of trudging across the landscapes of twanging guitar driven blues rock, dusty organ drenched psychedelic sweeps and always refreshing blackened rock and roll hubbles. Secondly, the Yankees have always had enough craftsmanship and gustiness to bring their endeavours to the fore in an unmarred way. 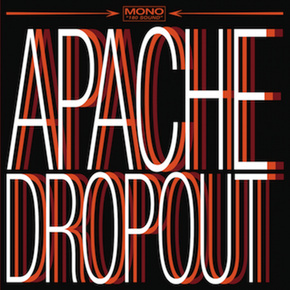 Apache Dropout`s vibe is charmingly rebellious and exquisitely negligent even if it could be understood retrospectively. For instance, let’s listen to Sam Phillips Rising where one could enjoy ecstatic, sensual screaming in the middle of chorus singing, rough guitar chords and overdriven riffs. Indeed, it is all about a chaotic environment but it is controlled and thereby managed and channelized more effectively than it would be done haphazardly. In fact, thanks to it all the minor elements included are masterfully magnified to surface them in front of the listener. In a nutshell, it is a spellbinding outing where you could draw parallels with such artists as Tom Waits, Johnny Cash, Captain Beefheart, Nirvana, Brian Jonestown Massacre, Jon Spencer Blues Explosion, Royal Trux, and Elvis Presley. The recent version involves 6 tracks but the Bandcamp-based one includes five more compositions.